PEARLY BITES Depp plays an 18th-century-born vampire discovering the joys of dental hygiene in Burton’s latest gothic extravaganza. Once you’ve browsed a gallery of stills from any recent Tim Burton film, you’ve seen the best parts. That’s not to say that Burton’s adaptation of “Dark Shadows,” the supernatural soap opera that ran on ABC from 1966 to 1971, is terrible. It starts quite promisingly, with a sumptuous gothic palette and a gallery of juicily arch performances from Johnny Depp, Michelle Pfeiffer, Jackie Earle Haley, Helena Bonham Carter and others. And, while Dark Shadows takes enormous liberties with the source material, it doesn’t warp it into something unrecognizable to its admirers, as Burton’s Alice in Wonderland did. Ultimately, though, Burton and screenwriter Seth Grahame-Smith fail to mold the twists and turns of roughly 1200 TV episodes into a compelling narrative. The film leaps from perspective to perspective, from story line to story line, from creepiness to satire to broad spoof, until it all explodes in a starburst of standard-issue CGI. 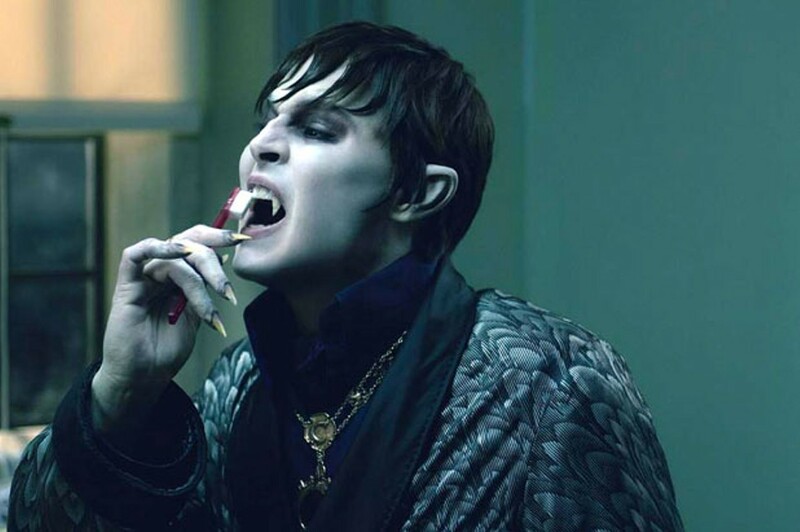 The filmmakers’ affection for the hokey daytime drama and its breakout star, the imperious, 200-year-old vampire Barnabas Collins (Depp), is palpable, even when they’re wringing cheap jokes out of his status as the ultimate grumpy old man. Vampirized and imprisoned in a coffin by Angelique (Eva Green), a witch whose love he spurned, Barnabas finds himself liberated in 1972 to return to his ancestral seat, Collinwood. But his descendants — including Pfeiffer as Elizabeth Collins Stoddard and Chloë Grace Moretz as her sullen teenage daughter — are letting T. Rex echo through the mansion’s dingy halls. Meanwhile, in the town of Collinsport, the ageless Angelique has used her powers to drive the founding family to the brink of bankruptcy. Only the chilly, virginal governess Victoria Winters (Bella Heathcote), who bears a face from Barnabas’ past, offers him hope of finding happiness among these 20th-century savages. Depp and Burton don’t make the mistake of depicting Barnabas as anything but a charismatic antihero. He maintains a seamlessly haughty, lord-of-the-manor mien even when he’s hailing the Golden Arches as the domain of Mephistopheles, and his true love for a dead woman doesn’t keep him from caddishly succumbing to the witch’s charms. But Angelique is a far too powerful antagonist for the film — cue the CGI fireworks — and she comes across as an evil mastermind with maddeningly stupid motives. Green does her best with the poorly written role, but one can’t help musing that, after two centuries, Angelique should consider joining a support group so she can put these petty anti-Collins issues to rest and get on with using her witchcraft to conquer the world. Without a strong central conflict, the film ends up wobbling from set piece to set piece, as if Burton were continually yelling, “Hey, check this out!” Alice Cooper playing a fancy ball at Collinwood! Barnabas communing with a fire circle of hippies, earnestly asking them about modern love! Bonham Carter milking her role as a boozy psychiatrist with New Jersey inflections! It’s all reasonably fun, to the point where viewers may find themselves thinking, If only the actors had time to develop these crazy characters ... for instance, on a TV show. “Dark Shadows” moved at a glacial pace by today’s standards, yet it somehow managed to make boomer kids obsess over Barnabas Collins and his convoluted backstory the way today’s teens do over Edward Cullen. The show spawned a cult; the most the film is likely to inspire are some awesome posters. * Running time: 113 min.